Go Power!’s latest iteration of our Portable Solar kit now offers you one of the largest portable kits on the market! 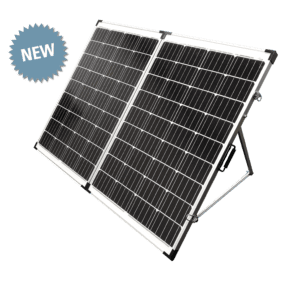 Our new 200-watt Portable Solar Kit (PSK) folding solar modules offer some of the most versatile and convenient battery charging options for those who don’t want to permanently mount solar to a rooftop or want to supplement a roof top system. The Anderson-style battery charging connectors allow you to quickly interchange the charging accessory to best suit your needs – from maintaining your RV or trailer battery while on the road to trickle charging your car, ATV or boat battery. 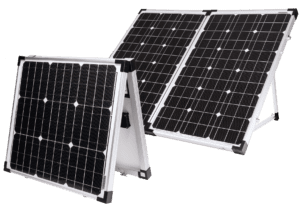 Adjustable folding legs to maximize solar exposure and for compact easy storage. Multiple charging connectivity options. Includes a heavy duty nylon case for storage protection. They also are a great supplemental solar kit to a roof top kit. Click here to learn more about the GP-PSK-200. Not ready for the 200 watt PSK? We have you covered! Check out our more powerful 130 watt and 90 watt kits to get you on the road and off the grid.